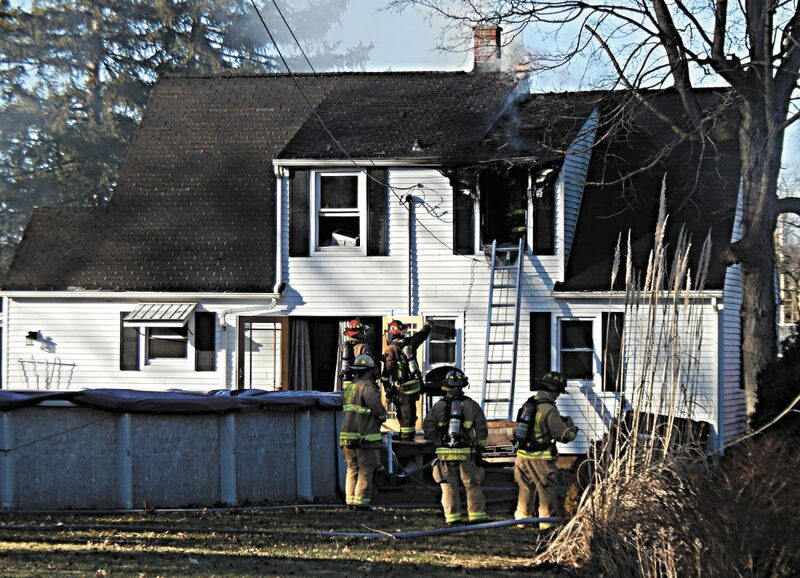 Personnel work at the scene of a house fire at 385 W. Market St. Saturday afternoon. A family was displaced after a house fire at 385 W. Market St. Saturday afternoon. Deputy Chief Rob Chappell of Tiffin Fire Rescue Division said the owner and two sons lived in the home, but nobody was home at the time of the fire. He said a dog was in the house and a person was able to get the door open and let the dog out. Chappell said nobody was injured in the fire. The property is owned by Jenny Douglas, according to the Seneca County Auditor’s Office website. Chappell said the family was displaced and they were with friends and family Saturday. The American Red Cross was contacted to assist, he said. Chappell said a neighbor saw smoke and fire and reported it. Smoke was visible from West Market Street when crews were traveling to the scene, and when they arrived, there was fire coming out of a back window, he said. Personnel used a transitional attack to fight the fire and sprayed water in through the window where the fire had already ventilated out of, Chappell said. Most of the fire was put out in about three minutes and he said firefighters were then able to go inside and put out the rest. Chappell said crews remained at the scene for about two and a half hours completing salvage and overhaul operations as well as conducting the investigation. He said the fire originated in a bedroom on the second floor. Chappell said the cause of the fire was undetermined and under investigation Saturday. The total loss estimate was about $25,000, he said. Chappell said the second floor had heat and smoke damage and the first floor had primarily water damage to the walls and ceiling. He said crews were able to put salvage covers out and were able to protect most of the belongings on the first floor. Chappell said American Electric Power responded to the scene to shut off the power and Tiffin Police Department assisted with traffic control. While crews worked at the scene, West Market Street traffic was down to one lane and Lindsay Avenue was closed. The fire was reported at 3:38 p.m.